….And San Dieguito Printers then. With a glorious family and regional tradition, San Dieguito Printers today embarks on yet another groundbreaking community and journalistic relationship. Perhaps you’ve noticed. How could you miss it? The venerable printing company that started as one of North County’s finest community newspapers and transformed into a leading printer provider produced the new print edition of The Grapevine debuting Oct. 8. When they say hot off the press, they mean it. This preview edition rolled off the presses yesterday and into your hands today and for many tomorrows. It’s all about quality and history for one of California’s largest privately owned printing companies. its full service printing facility is housed in a 34,000-square-foot building at 1880 Diamond Street in the heart of San Marcos. Today, the company continues to be operated by the Lapham family, four generations worth. The company does it all in the printing realm, everything from magazines, brochures, catalogs, manuals and newspapers. Aside from top quality production and customer service, what sets apart this printing company is its past. It all started in 1936 with the San Diego Citizen newspaper, a publication that made a name for itself as an “entrepreneurial crusader” with, as the name implied, citizen advocacy, and crusading editorials. La Jolla resident Jack Brereton founded the newspaper, but soon sold it to Elwood Barley who then flipped it to Noel P. Lapham, a retired La Jolla High School journalism teacher. Lapham bought the business in 1939 for $10, according to Richard Lapham, a third generation member of the family who started working for the company in 1971. Lapham described his grandfather Noel as an “entrepreneurial crusader” who bought the newspaper with a desire to bring about positive changes in the community. Printed first at Del Mar, then at Solana Beach starting in 1957, the newspaper was so serious about its mission that it printed goals for local government on the masthead until they were achieved. Perhaps its greatest goal was a 10-year crusade to build Interstate 5 just east of Highway 101. Competing interests, and even a rival newspaper, the Coast Dispatch, wanted the freeway either directly along the coast or more inland. The Citizen moved its printing press to its home office at Solana Beach in 1975. Then, something funny, but not in the amusing way, happened. The newspaper plant burned to the ground in June of that year. Arson was suspected, but authorities never determine a cause. 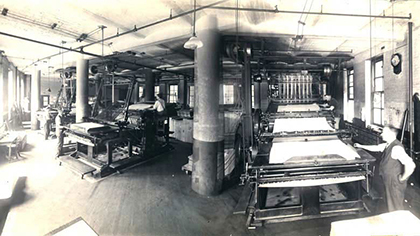 Competitor newspapers and Citizen employees stepped up the week after the disastrous blaze, printing and delivering the news only one day later than the usual issue date. That marked a watershed moment for the Citizen. Its Solana Beach office became editorial-only with printing done off-site. The company eventually opened its state-of-the-art San Marcos facility. As for the crusading newspaper known far and wide for quality and passion, Howard Publications bought it in 1979. Howard merged the Citizen with its well-regarded Oceanside Blade-Tribune into the new, and improved, Blade-Citizen. Howard combined the Blade-Citizen with the less well-regarded Escondido Times-Advocate in 1995, adding the Californian in Temecula in 1997 to what it called the North County Times. Doug Manchester bought the North County Times in 2013, then folded it leaving Escondido, San Marcos and Valley Center without any local media. Have no fear, thanks to San Dieguito Printers and The Grapevine, that kind of crusading newspaper work now continues in earnest. You’re welcome.